Whether you're an athlete aiming for the "zone," an executive striving for peak performance or a harried mother needing some serenity, a reliable meditation practice can be your best friend. Meditation shopping? Sounds like an oxymoron, right? Yet millions of Americans are seeking tools to turn within. As a nation we've tried to fix our problems with everything from psychotherapy and Prozac to positive thinking and politics. Now people everywhere are ready to close their eyes and take a dive -- not to escape, but to more fully be. Having lectured on meditation for 25 years, I find that audiences no longer need to be convinced of meditation's practical benefits. But people do often ask, "Aren't all meditation techniques basically the same?" Experts in the venerated traditions of meditation have always marveled at the mind's subtlety, appreciating its keen responsiveness and sensitivity to different mental procedures. Great master teachers of meditation have recognized that the various techniques engage the mind in different ways and naturally produce different results. With advancements in neurophysiology, scientists are now identifying distinctions among varieties of meditation practices. The old "scientific" myth that meditation practices all induce the same, general state of physiological rest -- called the "relaxation response" -- has been overturned. Though many practices provide relaxation, decades of research show that not all techniques produce the same physiological, psychological or behavioral effects. Recently a doctor came to me for meditation instruction. He had learned a "relaxation response" technique in a class on integrative medicine during his training at Harvard. He was attracted to meditation by the promise of deeper insight into consciousness -- access to the mind's hidden, transcendent potentialities. He enjoyed the relaxation technique but yearned for deeper experience and understanding. Reviewing the science journals, the doctor arrived at the same conclusion reached by leading meditation researchers: the "relaxation" model was based on inconclusive evidence and had never been substantiated. Hundreds of published studies on meditation techniques show varying effects from different practices -- ranging from measures of rest much deeper than the "relaxation response" to physiological states no different from sliding back into your easy chair. Controlled focus: Classic examples of concentration or controlled focus are found in the revered traditions of Zen, Tibetan Buddhism, Qiqong, Yoga and Vedanta, though many methods involve attempts to control or direct the mind. Attention is focused on an object of meditation--such as one's breath, an idea or image, or an emotion. Brain waves recorded during these practices are typically in the gamma frequency (20-50 Hz), seen whenever you concentrate or during "active" cognitive processing. Open monitoring: These mindfulness type practices, common in Vipassana and Zazen, involve watching or actively paying attention to experiences--without judging, reacting or holding on. Open monitoring gives rise to frontal theta (4-8 Hz), an EEG pattern commonly seen during memory tasks or reflection on mental concepts. Automatic self-transcending: This category describes practices designed to go beyond their own mental activity--enabling the mind to spontaneously transcend the process of meditation itself. Whereas concentration and open monitoring require degrees of effort or directed focus to sustain the activity of meditation, this approach is effortless because there is no attempt to direct attention--no controlled cognitive processing. An example is the Transcendental Meditation technique. 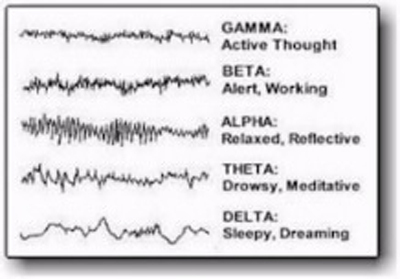 The EEG pattern of this category is frontal alpha coherence, associated with a distinct state of relaxed inner wakefulness. Some techniques may fall under more than one category: Guided meditation is controlled focus if the instruction is, "Hold attention on your breath." But if the instructor says, "Now just watch your thoughts, letting them come and go," then you're probably doing open monitoring--and your EEG would say for sure. Without the scientific research (or until we have a cell phone app for measuring our EEG and biochemistry), meditative states and their effects remain subjective. Brain research, along with findings on psychological and behavioral effects, gives a more objective framework for health professionals or anyone to determine which meditation technique might be most beneficial for a given purpose. For example, research suggests that concentration techniques may improve focusing ability. A study on advanced Buddhist monks--some of whom had logged more 10,000 hours of meditation -- found that concentrating on "loving kindness and compassion" increased those feelings and produced synchronous gamma activity in the left prefrontal cortex -- indicating more powerful focus. The effect of open monitoring or non-judgmental observation is said to increase even-mindedness in daily life; studies on mindfulness-type practices indicate better pain management and reduction of "negative rumination." For relief from stress, research suggests that an automatic self-transcending technique might serve you better than a practice that keeps the mind engaged in continuous mental effort. Because of the natural mind/body relationship, the more deeply settled the mind, the more deeply rested is the body. Studies show that the deep rest of "transcending" calms the sympathetic nervous system and restores physiological balance -- lowering high blood pressure, alleviating chronic anxiety and reducing stress hormones such as cortisol. More research is needed to verify benefits of controlled focus, but there are numerous studies on mindfulness practices and automatic self-transcending, with over 600 studies on the Transcendental Meditation technique alone. As meditation becomes a new frontier of scientific research, more and more people are becoming aware of the mind's enormous potential for impacting health and wellbeing. I find that most meditators are no longer concerned that a technique might come from the East or have roots in a spiritual tradition--their main concern is that the practice works, and science can help remove the guesswork. Americans are opting for meditation to counterbalance a life that's been plugged in, outer directed and over stimulated, and we're turning to something as simple as our own inner silence. 1. Orme-Johnson, Walton, 1998. American Journal of Health Promotion 2(5), 297-299. 2. Lutz, Greischar, Rawlings, Ricard, Davidson, 2004. Proc Natl Acad Sci U S A 101,16369-73. 3. Cahn, Delorme, & Polich, 2010. Cognitive Processing 2010 11(1):39-56. 4. Travis et al, 2010. Cognitive Processing 11(1), 21-30.